Today we welcome Yoichi Kotabe. 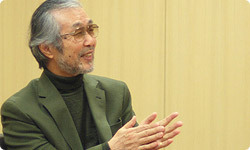 However, he hardly needs an introduction, since he is one of Japan's foremost animators. Because of his work as official illustrator for Mario, and the way he has improved the art world of so many of Nintendo's products, I think the coming together of Nintendo and Kotabe-san was an extraordinary occurrence. Kotabe-san is currently retired from Nintendo and active as an individual creator, but he has come all the way to Kyoto because I wanted to talk to him again on the occasion of the release of Flipnote Studio. Thank you for joining me today. 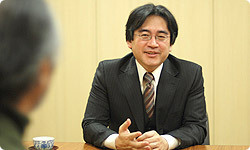 Before we talk about how your path crossed with Nintendo's, I would like to ask about what you were doing before that. How did you first encounter animation? Before this interview, Koizumi-san from the Tokyo office showed me Flipnote Studio. I asked him what it was for, and he said you could make flick book animation with it. I was surprised that you could do something like that with a video game, but something else came to mind as well. Flick book animation is how animation started. I first came to the world of animation through flick book animation. My father painted oil paintings, and as a child I liked art. I was always reading manga and copying the pictures. But it was my mother who got me directly involved in animation. Did your mother also draw? She didn't draw much, but when I was in elementary school she showed me flick book animation. She drew a stick figure on the corners of the pages of one of my textbooks. I think the figure was exercising. When I saw how it moved, I was surprised. I tried it myself and drew some flick book animation with stick figures. Even now I can remember how the figure would jump up to a high bar, flip around it, and then drop down. After that I was always interested in moving pictures. A mother's influence can be powerful. I was the oldest of five. Ever since I was little, she would whack me with a ruler. Even so, when I went to school, I hardly did anything but doodle. That must have been your father's influence. I suppose so. I grew to like art more and more, but my studies got worse and worse. You must have had a strong inclination toward the world of art. The high school I went to was originally an all-girls school, but it decided to try letting boys in, too. Those were the early days of girls' schools becoming mixed. That's right. It was the best girls' school in Tokyo, so the girls' grades were incredibly high. Which made me hate studying even more. (laughs) When I got out of high school, I wondered what I should do. My parents said I could go to a university if it was a public one. Just then, by chance, a friend who liked art told me that the entrance exams for Japanese-style painting departments consisted of nothing more than painting something in watercolor. I had never done Japanese painting - not even once - but I took the exam at the Tokyo University of the Arts, and by some quirk of fate I passed. It was a world full of people who were serious about art and looked down on manga. You went to school in the late 1950s. Back then manga hadn't achieved much recognition. My instructor at university was a well-known Japanese painter. I decided I wanted to achieve the same heights and become an artist even if it meant being poor. That's what I talked about with my friends, but when it came time to find a job, there weren't any. I can imagine it would be difficult to find a job in Japanese-style painting. It was. Out in society, there were no jobs involving drawing pictures. Then Toei Animation1 began recruiting. Did you immediately know that was the place for you? The first full-length animated movie that Toei made was called Panda and the Magic Serpent2. I saw it as a student and was thrilled. I'd grown up watching Disney animation and had always thought that Japan's animation wasn't worth much. But when I saw Panda and the Magic Serpent, I changed my mind. I was moved to see that Japan could make something so incredible. So anyway, Toei Animation started recruiting. I can't believe it. You really didn't get it? I was certain I would be accepted, so I had no idea what to do. I had really been excited about joining Toei Animation, so I was crushed. But Toei was on such a roll then, it wasn't long before they started recruiting again. I applied and was barely accepted. If you had given up, your life and the history of Japanese animation would have been completely different. How many people joined Toei Animation at the same time that you did? The company was flowering in those days, so about 30. 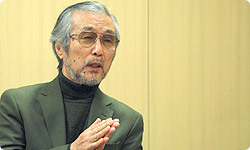 Norio Hikone was among them. 3 Uncle Carl is a popular cartoon character in Japan who appears on the packaging of snacks. Isao Takahata was there, too. Takahata-san of Studio Ghibli. That's quite a line-up. He was in the directorial department. He was a little older than me, but joined at the same time. 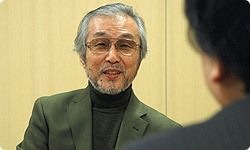 Studio Ghibli's Hayao Miyazaki also came from Toei Animation. Miya-san is five years younger than me. He is extremely distinguished now though. (laughs) Back when I was drawing key frames, he was in my group for a while.